The newest addition to the deck is the Weber Grill Center. It is essentially the Summit 670, with added cabinetry, storage, and an incredibly awesome 27000 BTU dual ring side burner. I love everything about this grill. Everything. My Performer is from 1999 and is the model before the 2005 redesign. 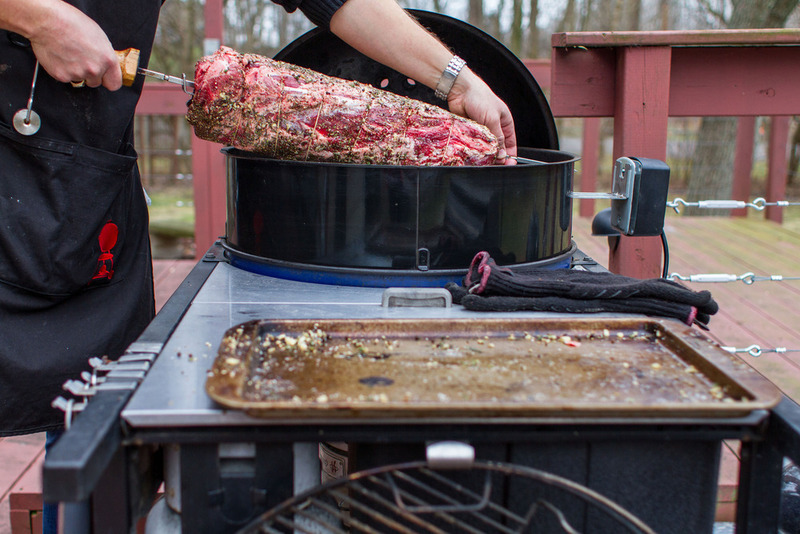 It uses the 5-pound refillable propane tank, which I find to be one of the greatest charcoal features in the world. I almost freak out when I inadvertently run out of gas and have to start a chimney the "old fashioned" way. The Performer has been through so much, it is on its second kettle bowl and lid. It was originally red. I originally had a second 22 1/2 inch kettle, but when I moved to the re-release of the 26.75 inch kettle, the 22 moved on to another backyard. Although I have always "dreamed" of the Weber Ranch Kettle, the 26 fits a perfect void between enormous and adequate. When you need extra space, like when grilling up 10 ribeyes, it really comes in handy. Thanks to a good friend of mine, this little blue beast landed on my deck. This is probably the only blue WSM in existence. It was part of a limited run at Weber. It then sat for awhile, until it ended up here. She is the prize of my fleet. In 2015, I added the Weber Q to the fleet thanks to my friends at Weber. While the Q has been around for awhile, Weber added a series of colored lids this year. It was my job to photograph them, as well as learn then ins and outs of the Q for a commercial photo shoot where I was doing the grill styling. What can I say, this is a really fabulous grill. Its portability and power are second to none. The Smokey Joe performs two functions: charcoal chimney holder and charcoal side burner. It's nice to have around, even if it spends a lot of time "on the bench." The 650 is the first generation of the 2007 Summit redesign. It is a true workhorse which I've had nothing but success with. In fact, the unboxing of 650 was one of my real first grilling adventures on APP. The OTG was my second kettle. It was a beautiful green. I sold it to a friend once I set my sights on the 26 inch kettle. It was a great grill and is still cranking out hot dinners today. The Saffire was provided to me by Saffire, in conjunction with a video project I did for them. It was my first kamado cooker. While I really loved to smoke on it, it has moved on to greener pastures.